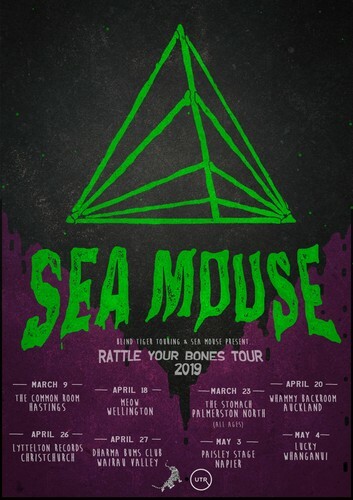 After 2 years of recording and performing in Wellington, the ferociously energetic band Sea Mouse are taking their hard-hitting, modern blues rock ‘n’ roll to throughout New Zealand over March, April and May 2019 on the ‘Rattle Your Bones’ tour. Sea Mouse is the fully fledged platform for the songs of Seamus Johnson, which fused, bruised and kicked its way into existence in 2016. The band have since become revered and respected in the Wellington scene for their enigmatic songwriting, uncompromising bass lines (Scott Maynard) and thunderous rhythms (Thomas Friggens). Nothing portrays Sea Mouse ’s hard-hitting, well-hewn anthems more than the thunderous and visceral nature of the live performance. The trio have a knack for shaking up a room and summoning your inner animal - hold onto your hats, it’s going to get loud. Sea Mouse are coming to daze and confuse, and rattle your bones.